Your skinny jeans ‘just wanna have fun’, as the song goes. Trust me, they really do. When you grab your skinnies at the weekend, wanting to be casual, because, well it’s the weekend, right… and comfort is quite rightly high on the list of priorities, avoid them fretting about you dropping down the casual scale to slouchy, by choosing snazzy stripes paired with a pretty print and funky high tops. And when you do, you’ll attract all kinds of locals, inextricably drawn to the sartorial good vibes you are giving off. Now don’t fall into the trap of thinking that by writing ‘dressing up’ I mean going full on glamour. No, no, no. That’s for when the sun has set and you fancy sipping a cocktail. The kind of ‘dressing up’ I mean here is creating a relaxed look that side steps the more obvious weekend choices of jeans and breton or graphic tee and plaid shirt, as fun as those combos are. You can take obvious pairs but find neat twists along the way and you’ll stand out a little more. pattern mix and are perfect partners. 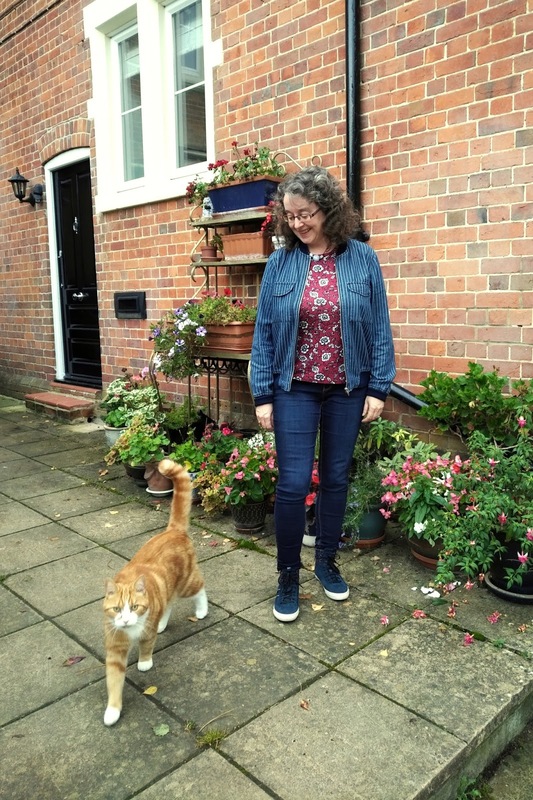 Ok, so now the photobombing cat is out the way, and you’ve all gone, aw…. dat’s just so darn sweeeet! … I can get back to posing and pontificating on the subject of pattern mixing. 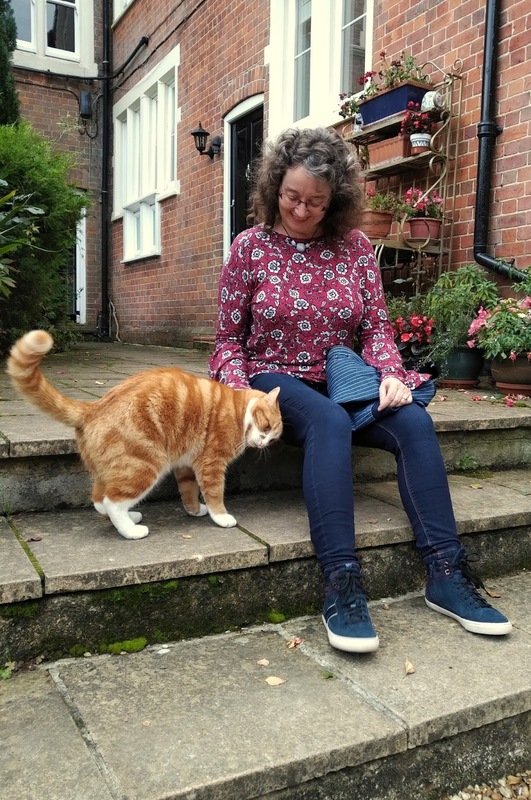 A breton striped top is in a class all of its own and I certainly love a breton stripe but sometimes you need to branch out with your stripes. I have a plethora of striped tops, which is why when I saw this petite, striped bomber jacket in the softest denim go in the ASOS sale back in the Spring, I knew it would be a great addition to my stripe family. It’s a show pony garment that since its purchase has become a much loved hero piece in my wardrobe. It goes with so many outfits, not just jeans. 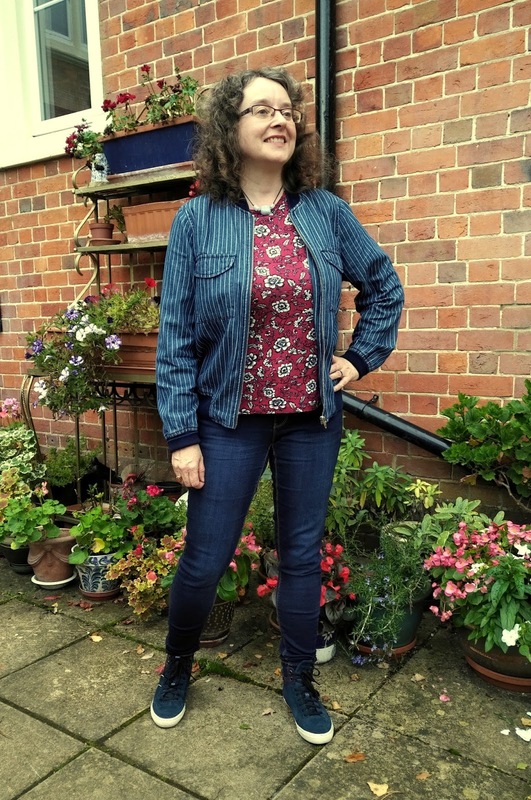 And this was despite my reservations about short-waisted, hourglasses wearing bomber jackets as per my Bomber Jacket & Rolled-up Jeans post from last year. Who wants to look like a rotound security guard? 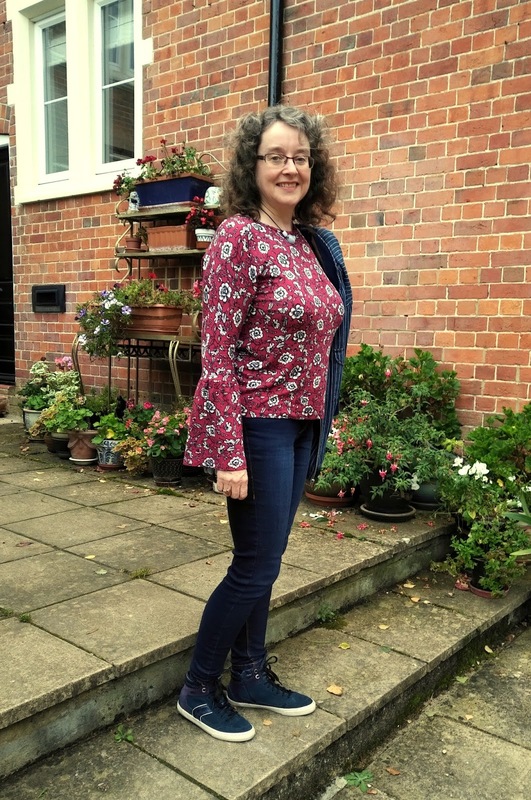 The denim is light enough to be a contrast to the dark wash skinnies and matches in colour tone to the floral top. And because both patterns evenly repeat, they work in harmony with each other rather than clash. And here endeth the pontification on pattern mixing, because it really is that simple. Quantum physics is hard, pattern mixing ain’t. If you’re aiming for a winning pattern mixing formula, or simply just beginning to explore the delights of pattern mixing, then you’d be undeniably off to a solid start with stripe and floral combinations. But it’s not just pattern mixing or even double denim, that’s going on here. Yes, I even slipped in double denim. Oh no. There’s a wee secret that I’m hiding. For under my jacket are statement sleeves that make my skinny jeans smile with joy! and fluted sleeves that have been more akin to sails than sleeves. I’ve certainly admired them and many a time I’ve absolutely raised a quizzical eyebrow at them. For as much as a pretty picture they doth make, they’re an utter nightmare in real life. A day’s work wearing some of the more outrageous ones I’ve seen? Yeah right. Washing hands? Cooking? Eating. Normal life. Yes, let’s burst a few fantasy fashion bubbles shall we? 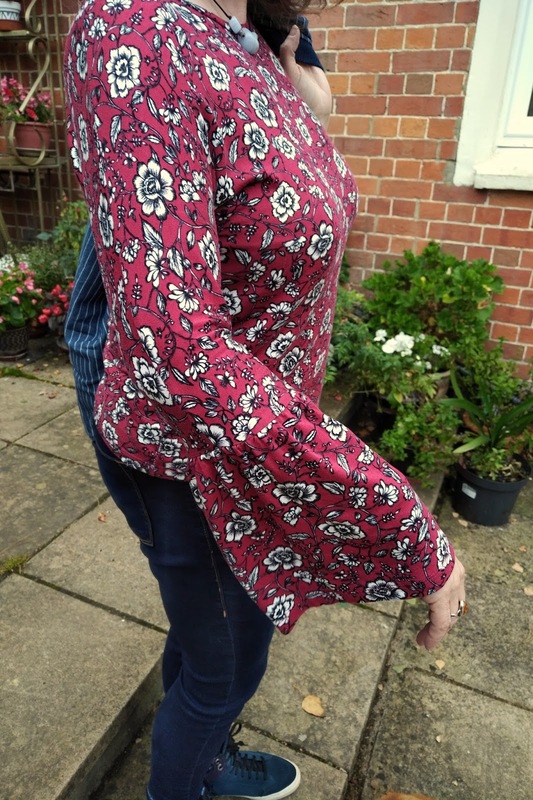 Now when I spotted this top a few weeks ago – and yes, it’s still available here, at a bargain busting £10 – I didn’t even notice the gentle bell of the sleeve until I tried it on in the changing room. That was truly a delightful surprise. When I saw it on the rail, I was more taken with how the print had a William Morris feel about it. ‘And,’ says small voice of reason, ‘the excellent price’. Ever an eye on the budget, has that small voice of reason. So despite my occasional scoffing of statement sleeves in terms of their practicality, I’ve managed to find ones that are playful without being completely impractical. I’ve seriously road tested this top! As these bell sleeves are sleeker than many, it makes it possible to wear a jacket over them, without having to laboriously wrestle the sleeves to sit flat under the jacket once you’ve slipped it on. 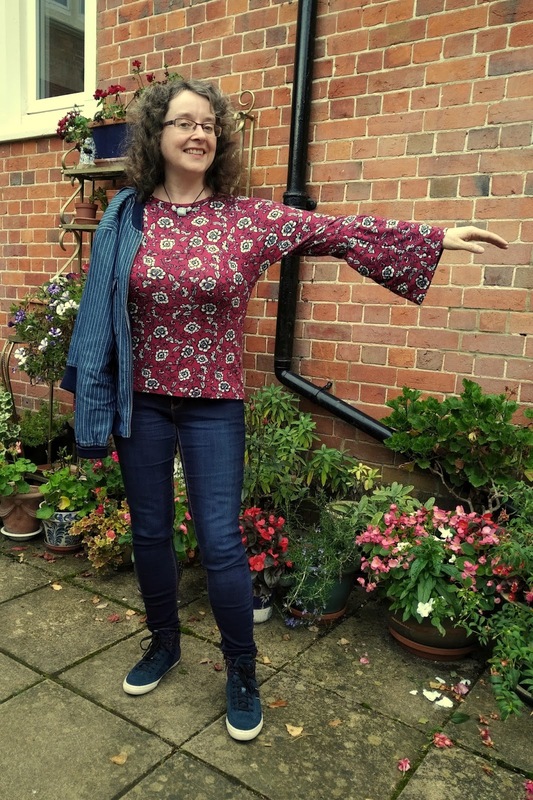 Plus the day I wore this, we went out for a leisurely family lunch with the in-laws and the sleeves survived soup, scallops and loo trips, unscathed! And if you’re a petite, there’s an extra bonus – it’s the perfect length. Always a joy to find tops that don’t drown my frame or required altering. And shall we take a closer look at the high tops? A dash of purple and reptile effect panels and side zips, up the ante for the skinny jeans. They were seriously swooning, I can tell you. I’ve always liked high tops but I’m not a huge label wearer and have tended to avoid buying the usual suspects such as Vans or Converse. My Geox ones, snaffled on a recce in T k Maxx awhile ago are uber comfortable, are unusual enough to tickle my taste buds and ideal if you’re wanting a more sporty or laid back look than ankle boots would give. 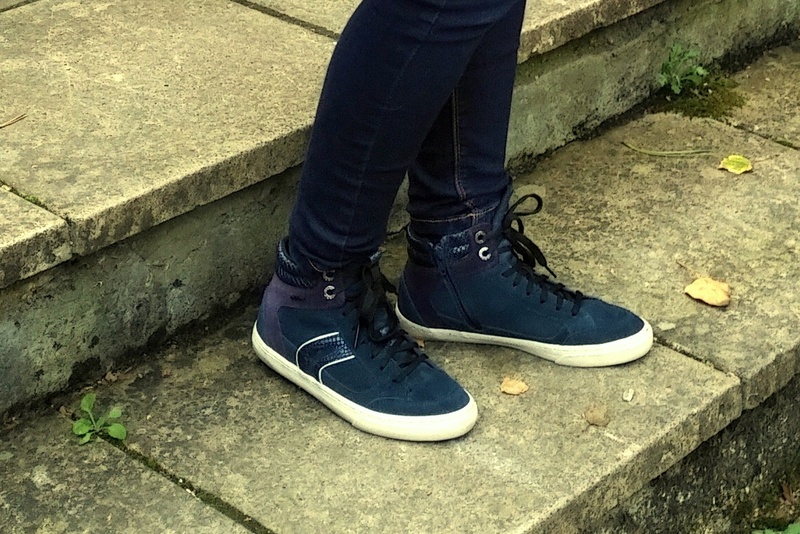 I rather like these Geox Myria Burgundy High Tops, currently on offer. And if you’re wondering that surely skinny jeans have had their day now, then think again. Skinny jeans have purportedly been having a slow death for at least two years now with everyone under the fashion sun stating we must lay them to rest. This time last year, ElleUK was proclaiming The Skinny Jean Is Dead and that we should all be embracing softer silhouettes and vintage styles. Well ya boo shucks to that I say. I love my skinnies. I won’t be giving them up anytime soon. Of course you don’t want to be a sartorial stick-in-the-mud and I’m all for wearing different styles to stave off boredom. Where trousers are concerned, my wardrobe overflows with culottes and joggers, so it’s not as if I’m a one hit trouser wonder! However, there is also much to be said for knowing what suits you and what feels comfortable on you. And skinnies do both for me. I struggle to find boyfriend jeans that look good on me. 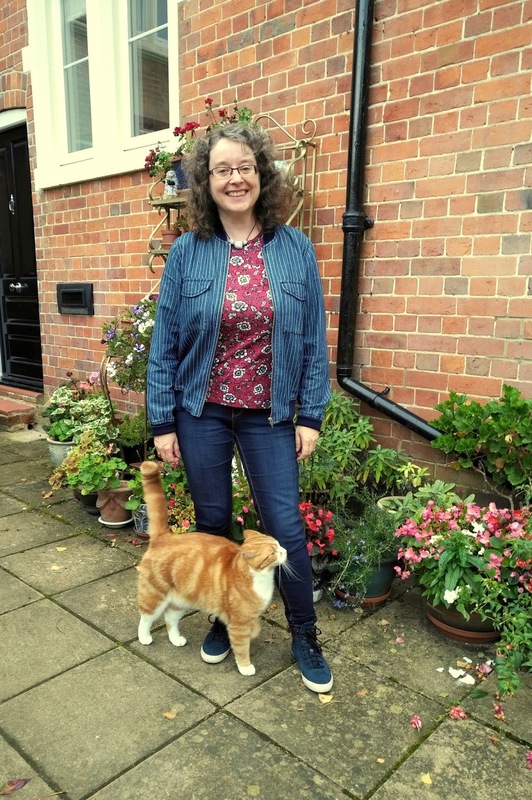 I did boot cut way back in my early 30s and crop kick flare leaves me cold to be honest. Vintage, frayed hem ones make me look like poor Annie orphan. Indeed, I really don’t see skinnies as being on the way out. Maybe they’ve been demoted in some fashion eyes. If so, then Gap surely haven’t got the memo. If you’re a skinny lover, head on over to their website and you’ll be in True Skinny heaven. They even have skinny cords – oh my! Corduroy is this year’s fashion comeback kid according to Refinery29 who reported only on Friday that the Corduroy trend is big for A/W2017. And hurrah I say. I never mind a spot of corduroy so my burgundy corduroy jacket I’ve had for circa 20 years has come right back en vogue! Dressing up your skinnies doesn’t have to mean pulling out all the stops with heels and sequins and other malarky. Weekend dressing should be relaxed and relaxing to wear. The trick is to find a couple of pieces that encompass a stand out element. My floral top is elevated by the bell sleeves, the bomber by the stripes. How do you like to dress up your skinny jeans? Do you like your sleeves to make statements, loud or otherwise? I’d love to hear your thoughts. what a lovely outfit!, I love the mixed prints and I agree on stripes and florals! they rock together! Love the kinda Morris print, and love the subtle color harmony, and love your sneakers too! You look gorgeous, relaxed, elegant and genuine!, that's fabulousness! Thank you Monica, what lovely compliments. Yes, the sneakers are definitely a favourite! I've read those same articles that skinny jeans are passe—but I'm going with the theory that I'm wearing what I love. Besides, it's so much more fun to have a couple of different silhouettes in my closet!! And kudos to your print mixing. I'm still working hard on trying to wrap my head around it, and feel good in it. Little by little I think I'm getting better!! And welcome back—I've missed you!! Thank you for your kind words Jodie. It's good to be back, even if it's intermittently! Exactly, wear what you love and what works for you. And yes, you don't just have to stick to one silhouette. And I'm loving print mixing at the moment. I seem to be gravitating to it more and more! Thank you Ada. 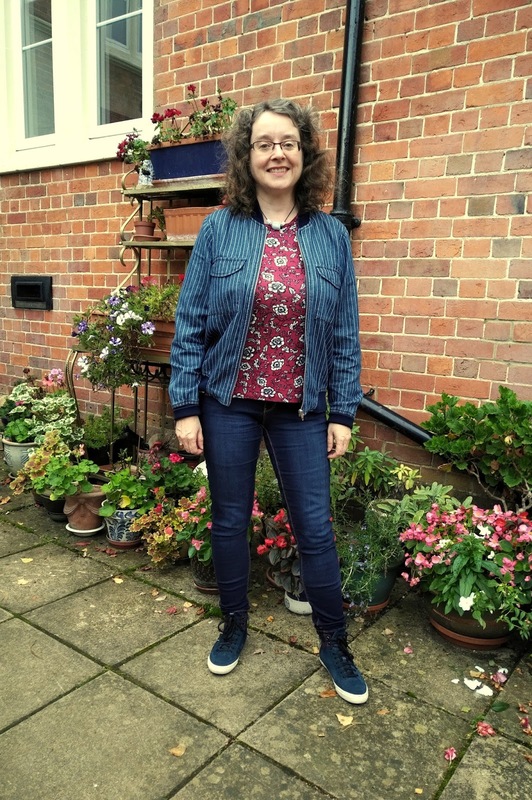 The bomber jacket was a real find and has become a favourite piece in my wardrobe and is so easy to pattern mix. Thank you Laurie. Yes, it's so good to find sleeves that don't trail on the floor! I love how you mixed the two prints and the sleeve on that blouse. Thanks for sharing on the link up over at A Pocketful of Polka Dots' Fabulous Friday. Thank you Nailil. I do love a spot of pattern mixing! I've gotten much better at trying to print mix, and you've done it perfectly here, Jacqueline!! Thanks Jodie. It's a learning curve with the pattern mixing. The more you do it, the more confident you become at it. I love the pattern mixing and think this works so well together! I love my skinny jeans, they are my go to jeans! I have some straight legs jeans not so much skinny jeans as i have sensitivity in my legs at times. I do love the pattern mixing, but the burgundy color with the fancy sleeves, I am eyeing! i also love those sneakers too. Great look and i thought the kitty was yours!